The Antithesis Of Modern Day Hatteras Island. Welcome to Buxton Cottage - The Skipper. The antithesis of modern day Hatteras Island. 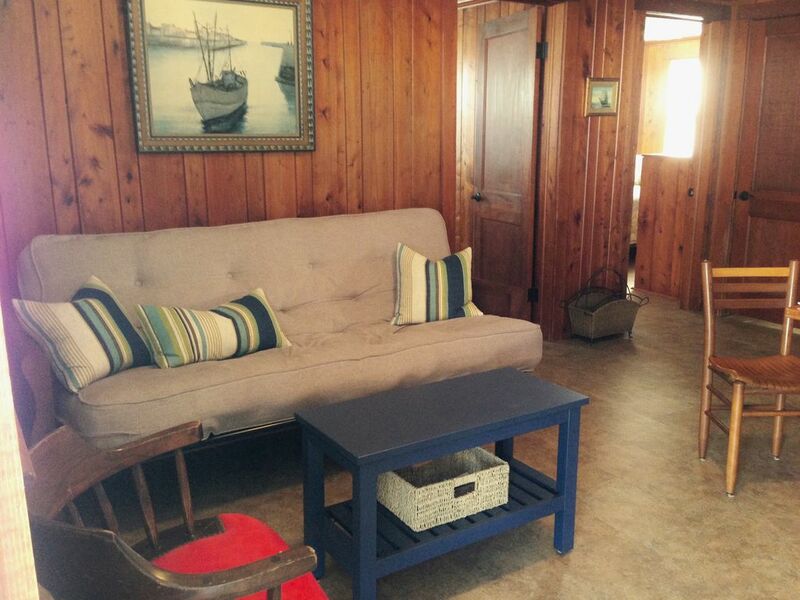 Come enjoy this cozy 1950’s beach cottage freshly updated with all the modern amenities. This two bedroom, one bath getaway will cater to all your needs - and just steps from the beach. The Skipper has two bedrooms, one bath, kitchen fully equipped, TV, internet, Wi-Fi, all linens are provided (4 bath towels and each bed has 1 set of sheets), complimentary items such as one roll of toilet paper, coffee filters and trash bags. Puzzles, cards. Parking and outside seating on the balcony. NEW: Outdoor Shower with sink! NOTE: This is triplex and the unit is located upstairs with a flight of stairs to the front door. Therefore, it is not well suited for the handicapped or elderly. IMPORTANT: Maximum occupancy of 4 people is strictly enforced. Buxton Cottage is NOT to be used for group events or gatherings. SMOKING IS NOT PERMITTED. Failure to comply will result in eviction without a refund. Relax at the heart of the island. Buxton is centrally located between all of the best spots to kite board, wind surf, fish, beach access, surf, paddleboard, walk, hike, and bike. Just few minutes’ drive to the Cape Hatteras Lighthouse and beaches. You can walk to the Lighthouse beaches, and restaurants. Everything is within walking or biking distance. Provided for your convenience - 4 bath towels, 2 hand towels, 4 washcloths and 1 shower mat. Oceanside - 10 lots in from the Ocean and just a 2min walk to the beach! 1 queen sheet set for each bed; including 1 full sheet set for futon sofa in living room. Private driveway parking (maximum 2 vehicles). No parking in sideyard or backyard. 4 bath towels, 2 hand towels, 4 washcloths and 1 shower mat. 1 Roll of Toilet Paper. 32" TCL Flatscreen TV with Netflix / Roku; FREE WiFi; Shared covered deck with 2 Chairs and Side Table; Private parking for 2 vehicles; BONUS + Spacious Backyard with 4 "Tie-Down" Kite Drying Stations. New Outdoor shower and sink for washing out gear after being at the beach all day. NOTE: NO cleaning or disposing of fish parts in the sink!! We came during a bad thunderstorm and a moat quickly formed around the property. Rules say no refunds for storms. The bed frames squeak when you sit on any edge of the bed itself and the trash can in the kitchen is way too small. Despite the rain, and bad weather, we did ok. Not enough utensils and very little dishwashing soap was left for us. A paper towel roll would be nice as there were none. Linda was accommodating. We just went at a wrong time. Comfortable place & good location. Friendly & helpful owners. Enjoyed stay. Shared porch allows chance to meet new people. Convenient to grocery stores. Nice outside shower. Short walk to beach. Would stay here again. The Skipper is a small and comfortable apartment type accommodation in Buxton. The unit is located on the upper floor of a building shared with a similar rental next door. The other unit was unoccupied while I was there. Two bedrooms, a single bath, kitchen and small living/sitting area. You can easily walk down the street to the beach which is only about 125 yards. While not "new and modern", overall everything was great and in good working condition. The wood interior is pretty cool. There is WiFi, cable TV with "Roku" and an outside shower and hose so you can easily get cleaned up when returning from the beach without tracking sand in with you. I did have contact with the owners before and during my stay and they were quick to respond and helpful. Thank you. We couldn't ask for more! The beach was fabulous and only steps away. The Skipper was very neat and comfortable with all the comforts of home. Conveniently located to excellent restaurant and grocery store. The Skipper was a clean and cozy place for our stay at the beach. It was less than a 5 minute (easy) walk to the beach and it was also a 5 minute walk to a custard shop and a couple of restaurants and stores! Great location in a quiet, relaxed neighborhood. 2 bedrooms with 2 full beds was just the right size for our family of four. The communication with the owners was efficient and friendly. The only real downside applied to the entire town, not just the rental, but there were so many mosquitoes! (Maybe this was just because it was a super rainy summer?) Pack your bug spray when you go and you'll have a great stay. AS ADVERTISED, WE LIKE THE OLD SCHOOL PINE BEACH BUNGALOW. FLOOR PLAN GOOD, KITCHEN FULL COVERAGE. EASY ACCESS FROM PARKING. A.C. IS EXCELLENT. CABLE TV AND FLAT PANEL NICE. THE BEACH IS CLEAN AND EASY ACCESS. 2 BLOCK WALK TO CONVENIENCE STORES, GAS, PIZZA, AND BEER. Buxton is centrally located between all of the best spots to kite board, wind surf, fish, beach access, surf, paddleboard, walk, hike, and bike. Just a short drive or bike ride to the Cape Hatteras Lighthouse. You can also walk to the Lighthouse beach and restaurants. Everything is within walking or biking distance. KITE BOARDERS AND WIND SURFERS: Just 1.8 miles from one of the premier kiteboarding locations, Kite Point. Enjoy 6.8 miles down winders from Kite Point to North Avon pull out. Or even further if you’d like! We're Oceanside - just 10 lots in from the Atlantic Ocean. Enjoy surfing, fishing, jogging, lounging at the beach - just steps away! Rates are subject to change until reservation is confirmed and rental agreement is signed and returned. 3 Night Minimum stay accepted outside of Memorial Day through Labor Day Summer Season.